One of the big differences encountered in commercial versus residential real estate is that with residential real estate there are a number of government programs and loans that allow buyers to purchase residential real estate for low to zero money down and have low interest rates. With credit scores as low as 580-600 in some cases homebuyers can buy a home with little money down with a 30 year fixed rate mortgage. With commercial real estate on the other hand buyer’s credit scores are closely looked at and lenders want to see strong credit as well as sufficient assets to protect in case of default on the loan. Commercial lenders do not have the same government loan programs and instead will offer loans with high interest rates and shorter terms (15-20 year loans sometimes with a balloon payment due at the end). Additionally commercial lenders are looking for minimum 20% down payments for those with excellent credit but will more likely be required to put down 30% or more of the purchase price in order to get a loan. In order to encourage homeownership the U.S. Government setup a number of programs to help individuals buy homes. There are loan programs for military veterans (VA loan), buyers in rural areas (USDA loan), and programs for those with little money for a down payment (FHA loans). In addition the government setup secondary entities whose sole purposes is to buy mortgage loans from lenders so that the lenders have additional money to lend to others in need of a mortgage. This secondary market for mortgages ensures banks can provide loans to qualified buyers and in turn sell the loan to a purchasing agency like FHMA (FannieMae) or FHLMC (FreddieMac). The mortgage payment terms stay the same for the borrower. Residential mortgages are available for single family homes and for four unit or fewer multi-family homes (residential buildings of five units or more require a commercial loan). In the case of VA, USDA and FHA loans the federal government will guarantee those loans in case the buyer stops paying on the loan. With commercial real estate it is more a principal of allowing the most successful use of the property to succeed so what that means is there is no government guarantee program for those loans. Therefore commercial lenders have a higher level of scrutiny for commercial loans since their only security in case of default is the actual real estate itself which is being purchased with the commercial loans. As a result commercial loan lenders want to make sure borrowers are credit worthy, can put enough of their own money towards a down payment and have an excellent business case for use of the property. 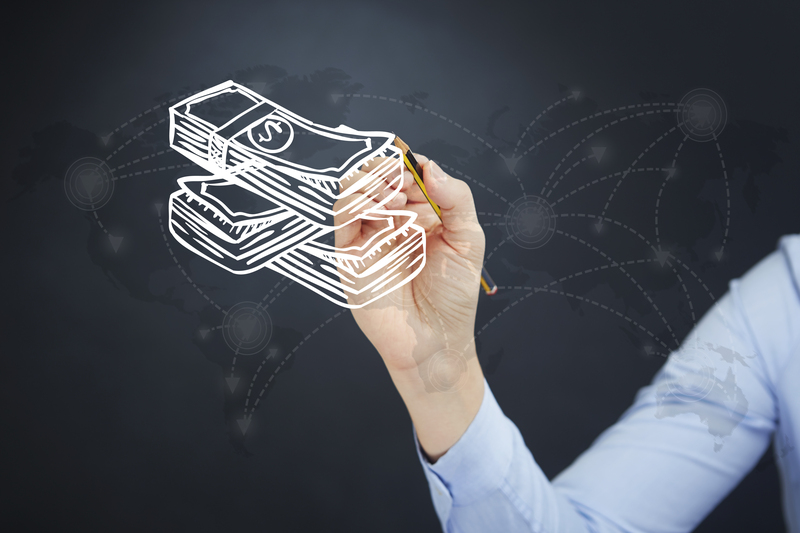 Lenders can and will examine existing business financials or will look at the business plan of a new business and are likely to seek additional collateral (such as personal residence, vehicles, other real estate or more) in order to secure the loan. Generally with residential real estate most of the real estate listings for sale are found on the local Multiple Listing Service (MLS). The MLS in turn pushes out those listings and shares to other websites like Realtor.com, Zillow, Trulia, local real estate websites (like CinciNKYRealEstate.com) and more. When most homebuyers are looking for a home they will use websites that get their information from the MLS. Certain For Sale By Owner (FSBO) homes for sale may be on the MLS or Zillow depending on what type of service the FSBO homeowner is using. While some commercial real estate is found on the MLS a majority of commercial property listings are found on non-MLS sites. The MLS may contain commercial listings for residential buildings or buildings that serve both residential and commercial purposes under one roof. The MLS may also show some office space and retail space for lease or for sale. One of the larger commercial listing websites is Loopnet.com. Commercial listings also may be found on local commercial real estate broker websites. With the nature of commercial real estate the way it is, marketing is done for it through the large commercial real estate portals and word of mouth working with buyers and sellers. A residential real estate agent needs to specialize in marketing a home to buyers who are looking for a great place to stay. Today a majority of buyers are looking for move in ready homes with little post move in work to do. As a result home sellers should be talking with real estate agents to understand what they need to do in order to get their home ready for sale. Residential real estate agents should excel at marketing, photography, videography, staging and more in order to make sure as many buyers see the home online and thus have an interest in visiting in person. On the other hand with commercial real estate it is the less frequent occasion that a buyer wants a commercial property as is without customization for their business. In the case of commercial residential real estate or investment real estate then yes the buyer may not care as much how the apartments or buildings look and can leave them as is unless they are looking to increase rents through having the units updated after they make the purchase. For most other commercial properties like office space or retail space the floor plan and layout will need to be modified for the specific use of the buyer. As a result the current interior look of a commercial real estate property does not matter as much since it will likely be changed anyways to suit the needs of the buyer. The buyer is more looking to the quality of the building and the suitability of the interior for the changes they will need to make based on their use of it. The marketing skills a commercial real estate agent needs will be quite different than the skills needed by a residential real estate agent. While some do succeed at being both a residential and commercial real estate agent the skill sets are different enough that sellers of whichever type of real estate should make sure their agent primarily works with one or the other. Residential real estate sellers where the property is to be occupied by the owner for their living space should use a real estate agent who knows how to market single family homes. Someone selling commercial real estate should work with a commercial real estate agent who has a deep network of business contacts and knows who to call in order to find another business owner who needs the exact type of building being sold. From financing and marketing to the type of real estate agent involved there are a number of differences between residential and commercial real estate. Sellers of real estate should make sure their agent knows how to properly market the type of property they want to sell. While some agents may be willing to cross over to sell residential when they primarily sell commercial (or vice versa) the skill set used to sell one type may not properly apply to the other. 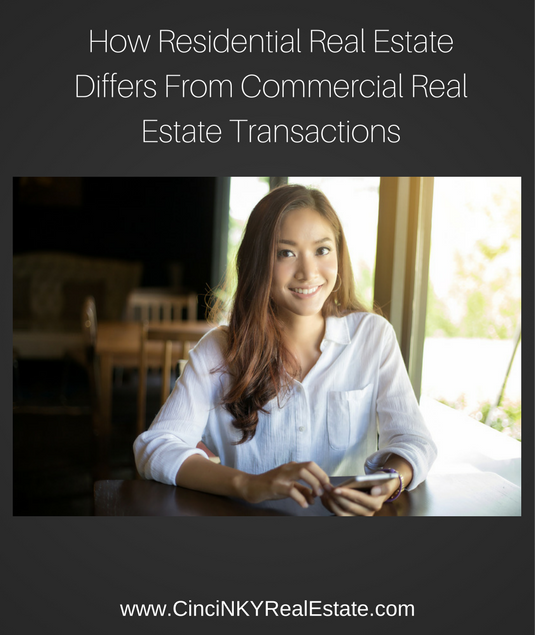 About the author: The above article “How Residential Real Estate Differs From Commercial Real Estate Transactions” was provided by Luxury Real Estate Specialist Paul Sian. Paul can be reached at paul@CinciNKYRealEstate.com or by phone at 513-560-8002. If you’re thinking of selling or buying your investment or commercial business property I would love to share my marketing knowledge and expertise to help you. Contact me today!